Does Baby Powder Cause Cancer? A Jury Says Yes. Scientists Aren't So Sure : Shots - Health News Scientists have found an association between talc and ovarian cancer, but they don't agree on exactly what that means. 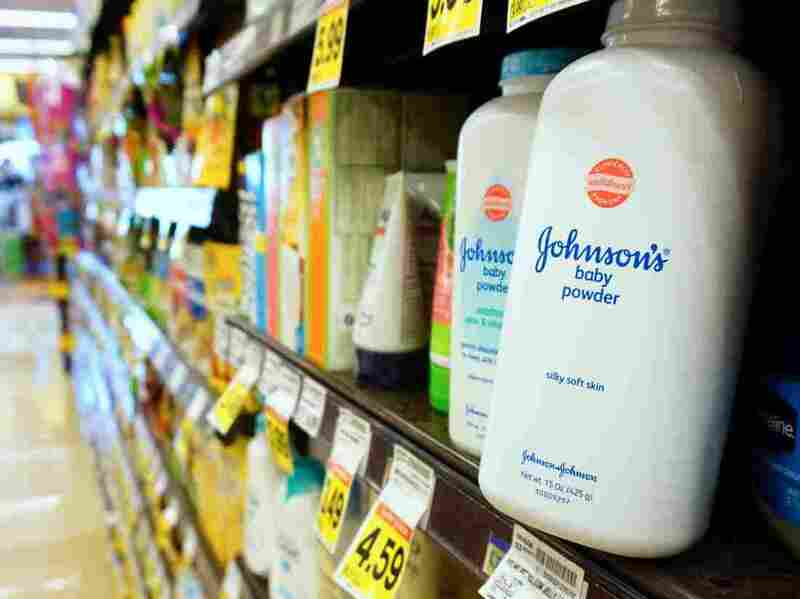 A California jury awarded a woman $417 million in a case against Johnson & Johnson. The woman claimed that her use of Johnson's Baby Powder led to terminal ovarian cancer. Scientists disagree on how strong a link there is between talc and ovarian cancer. If you're a woman, there's a good chance you've used Johnson's Baby Powder at some point. It smells good, and it can keep you dry. Dr. Daniel Cramer says yes. He's a professor of obstetrics and gynecology at Brigham and Women's Hospital in Boston. He says talc — the mineral in talcum powder — can cause ovarian cancer. "Overall, women may increase their risk in general by about 33 percent by using talc in their hygiene," Cramer says. On Monday, a California jury awarded Eva Echeverria $417 million in a case against Johnson & Johnson. Echeverria, who is suffering from terminal ovarian cancer, claimed it was caused by Johnson's Baby Powder, which she used on her perineum for decades. Hers wasn't the first jury award against the company. And thousands more cases are pending. It has opened a long-simmering question about whether talcum powder used in the genital area can cause cancer. Cramer, who has served as a paid consultant on several ovarian cancer cases against Johnson & Johnson, published one of the first studies noting an association between talc and ovarian cancer in 1982. "This story goes back a long, long way, back into the '70s when people noted that ovarian cancer had many similarities to asbestos exposure," he says. "Meanwhile another group in England found talc that was deeply embedded in ovaries and said there might be a story here." In fact, talc is a mineral that is sometimes mined alongside asbestos. And asbestos, a known carcinogen, was found in the past in some talc products. After his first study on the talc-cancer association, Cramer followed up with an article in 1985 calling on companies like Johnson & Johnson to put warning labels on their talcum powder products. Johnson & Johnson declined to be interviewed for this story. The company said in a statement that it plans to appeal the California verdict. "We are guided by the science, which supports the safety of Johnson's Baby Powder," wrote company spokeswoman Carol Goodrich in a statement. "In April, the National Cancer Institute's Physician Data Query Editorial Board wrote, 'The weight of evidence does not support an association between perineal talc exposure and an increased risk of ovarian cancer.' We are preparing for additional trials in the U.S., and we will continue to defend the safety of Johnson's Baby Powder." Some researchers agree that the link between talc and ovarian cancer isn't all that clear. The International Agency for Research on Cancer, part of the World Health Organization, in 2010 called talc a possible carcinogen. "It's not proof positive," says Joellen Schildkraut, a professor of public health at the University of Virginia. "These studies are suggestive. They support the idea." Her research shows there's a stronger link between talc and ovarian cancer among African-American women than there is among white women. But to her, even that link isn't proof. "I would not call this conclusive. It's consistent with other reports in the past. It's suggestive of a stronger association, but it is not conclusive," she says. There are theories about how talcum powder could cause cancer. If women put it on their underwear or on feminine products, it could get into their reproductive system. Then, talc particles could make their way to the ovaries — research has already shown that can happen, and talc has been found in ovarian tumors. The talc could then cause irritation and inflammation that, over time, could lead to cancer. "We can say that it is associated with an increased risk [of cancer]," says Shelley Tworoger, a cancer epidemiologist at the Moffitt Cancer Center in Tampa, Fla. "And there are biologic mechanisms by which we think that talc could actually impact ovarian cancer. But I would stop short of saying that it necessarily causes ovarian cancer." But she says there's certainly enough information out there to guide women. "Why use it?" she says. "I don't know if I should say this or not, but ... why not just be safe and not use it?"